Event location: Marriott Marquis hotel, Independence D, Washington D.C. 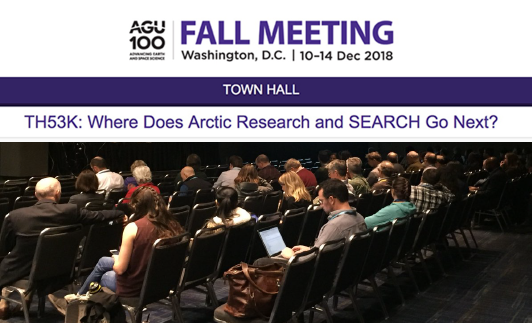 The Study of Environmental Arctic Change (SEARCH) will be hosting a town hall during the American Geophysical Union (AGU) Fall Meeting from 12:30 - 1:30 p.m. EST on Friday, 14 December 2018 at the Marriott Marquis, Independence D in Washington D.C. The SEARCH town hall will convene scientists from diverse disciplines whose research addresses the rapidly changing Arctic environment. SEARCH is a multi-disciplinary, multi-institutional program supported by National Science Foundation to synthesize scientific information about the rapidly changing Arctic—and its far-reaching impacts—and to effectively convey that knowledge to decision makers. Recognizing that unprecedented environmental change challenges the pace of research, SEARCH will explore with interested scientists where the program has provided benefit and—more importantly—where it could do so in the future. After a brief overview of SEARCH’s recent efforts (focused on sea ice, land ice, and permafrost), contributing members of SEARCH will lead a discussion considering: How can the Arctic research community best advance actionable and discovery science? What could or should a multi-disciplinary effort accomplish that otherwise would not get done? How might our community use the upcoming (September 2019) Arctic Futures 2050; Science to Inform Decisions conference to advance science and serve pressing policy needs? Light refreshments will be served.